Populonia is a medieval hill town in the part of southern Tuscany called Maremma and it’s also the site of one of Italy’s top ancient Etruscan cities, the only one by the sea, on the Gulf of Baratti. The ancient Etruscan town of Populonia dates from the 9th century BC. 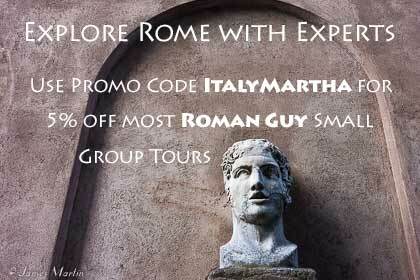 It was one of the 12 powerful Etruscan cities and the only one with a harbor. Etruscans were fine metalworkers, masters at casting and adept at hammered bronze and iron products. On the Via del Ferro route, you’ll see reminders of Etruscan iron working from the 6th to the third century BC, some of the ore coming from the nearby island of Elba. In fact, the coastal burial grounds, the Necropolis of San Cerbone, was buried under an enormous pile of slag left over from the process. It wasn’t until the Italians needed iron for WWI that they looked at the slag and discovered that the ancient process only extracted about 40% of the metals. When they removed the slag for reprocessing they discovered the tombs below the slag heap. As the city developed, the tombs also developed, becoming more elaborate. People, especially from the upper class, started to create large family tombs, often with decoration, and were buried with jewelry and objects used in the funeral banquet such as dishes and cups. 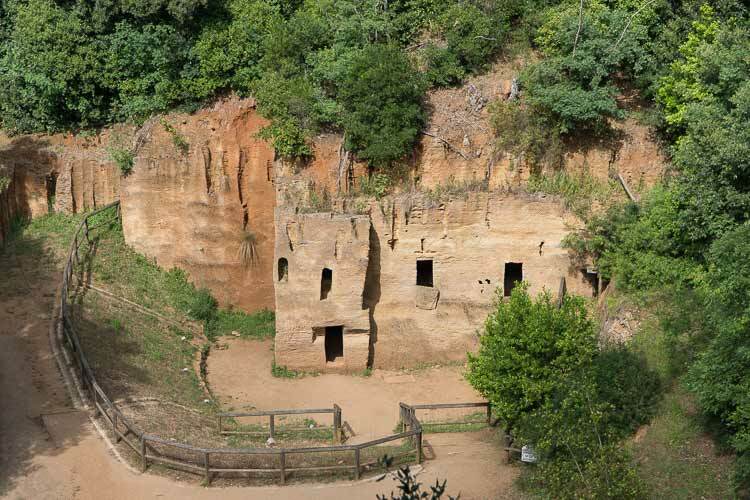 In the Archaeological Park, visitors have a chance to see several different styles of Etruscan tombs in different locations. Ticket prices depend on which areas you want to visit. Closest to the visitor center, and the easiest to get to, is the Necropolis of San Cerbone where there are burial mounds and tombs from the 7th – 6th centuries BC. Getting to the Necropolis of the Caves requires a hike up the hill into the woods, taking 30 to 40 minutes. 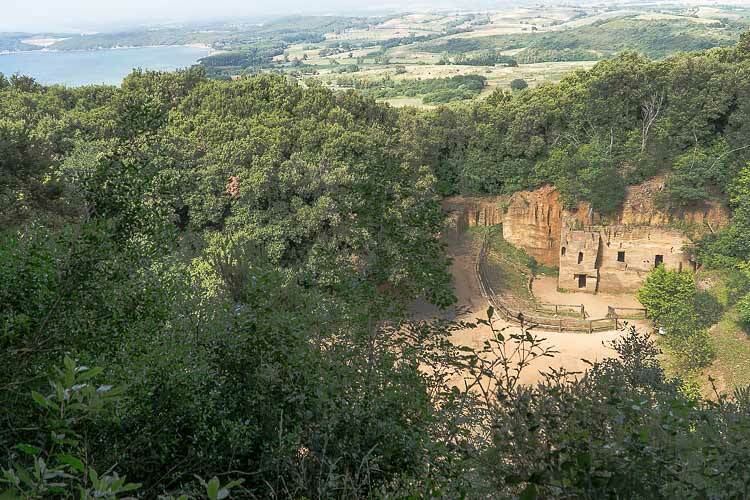 In addition to the tombs, visitors are rewarded with beautiful views of the Gulf of Baratti and beyond. There are also ancient quarry sites where stone used for building was excavated. The tombs in this necropolis are mainly chamber tombs dug into the rock. Some have staircases leading down to the tomb and a few have some decoration inside. 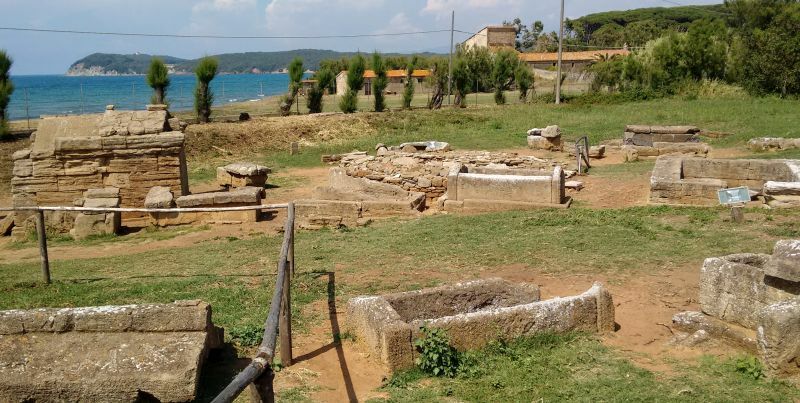 The Archaeological Park of Baratti and Populonia is between San Vincenzo and Piombino on the southern coast of Tuscany. There’s a free parking area right by the Archaeological Park (which has a big sign in front of it, so drive until you see the sign rather than parking in the paid lots along the road). Populonia has a small train station (usually reached by changing trains in Piombino) but it’s away from the site and town so you’ll need to take a bus or taxi. At the visitor center is a gift shop, bar, and restaurant. There are several other hiking trails you can access from the Archaeological Park as well. Up the hill from the sea and necropolis is the more “modern” town of Populonia. It’s built next to the Etruscan acropolis with public buildings and temples, another part of the Archaeology Park (currently closed when we visited in June, 2016) that also includes Roman ruins. There’s a parking lot between the archaeological site and the town. The medieval hill town of Populonia has one main street with a few shops, a bar, and restaurant. Just above the main street is the tower and surrounding walls, from 10AM to sunset every day from April 1 through mid-October but only on weekends and holidays the rest of the year (closed 25 and 26 Dec). 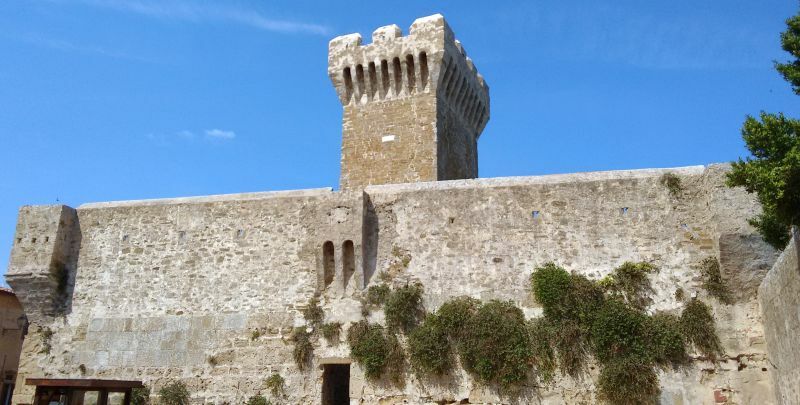 There are some good views from parts of the wall but climbing to the top of the tower gives you great panoramic views of the town and sea. Visit the small but interesting museum, Museo Etrusco, a private collection of finds from the Etruscan sites. 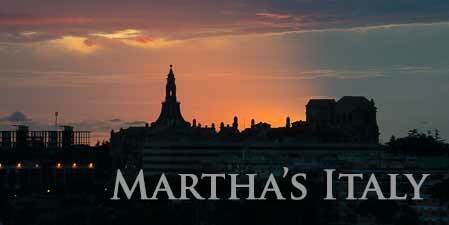 There’s a good introductory film, too. The museum is open 10 to 13 and 15 to 20, April 1 through mid-November and 10 to 13 and 15 to 18 on weekends during the rest of the year. Another interesting and well-preserved hill town in this part of the Maremma is Campiglia Marittima, about 12 miles northeast of Populonia. It’s pretty streets and staircases wind up the hill to castle remains at the top. The seaside town of San Vincenzo, about a 15 minute drive from Populonia, makes a good place to stay. San Vincenzo has good beaches, restaurants, bars, and shops. 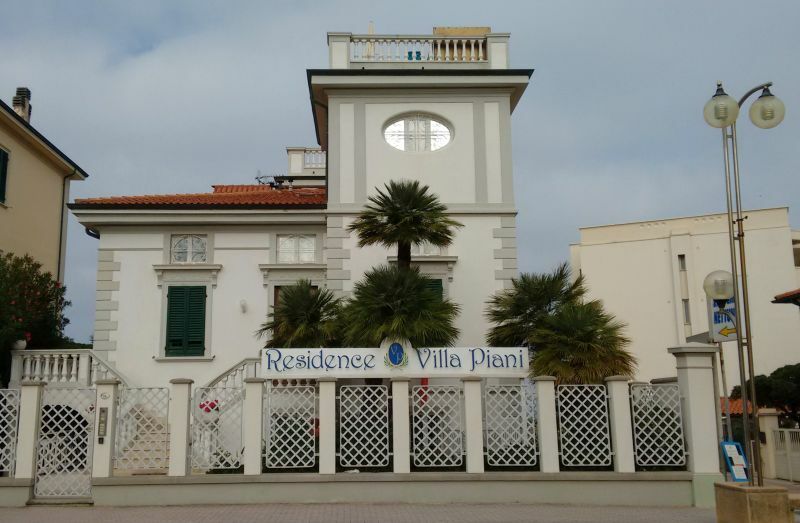 We stayed at Residence Villa Piani, with comfortable vacation apartments by the sea. Between San Vincenzo is Parco Costiero di Rimigliano, a long stretch of coast with a park that has walking paths and public beaches. Near the sea in Populonia, Torre di Baratti Bio Resort has 6 rooms in a renovated farm house and restaurant. The surprisingly nice port town of Piombino makes an excellent place to stay also.